This is the second album from Indian death metallers Gutslit. I have a certain fondness for Gutslit’s 2013 debut album Skewered in the Sewer. This was an extremely enjoyable release that took brutal death metal and injected a Gorerotted-style sense of playful groove and belligerence into it, resulting in a very memorable and effective album that also made it high into my best of 2013 list. 2013 seems like a long time ago now, but finally the wait for new material is over, as the band now offer up 29 minutes of fresh meat for us to get our bloody claws into. The first thing that strikes me is the fact that the band have a new singer, who also happens to be the vocalist of the extremely delectable Godless. Well, if you’re going to change singers you could do a lot worse, as he’s more than proved himself able with Godless’ debut EP and his performance on Amputheatre is just as impressive. 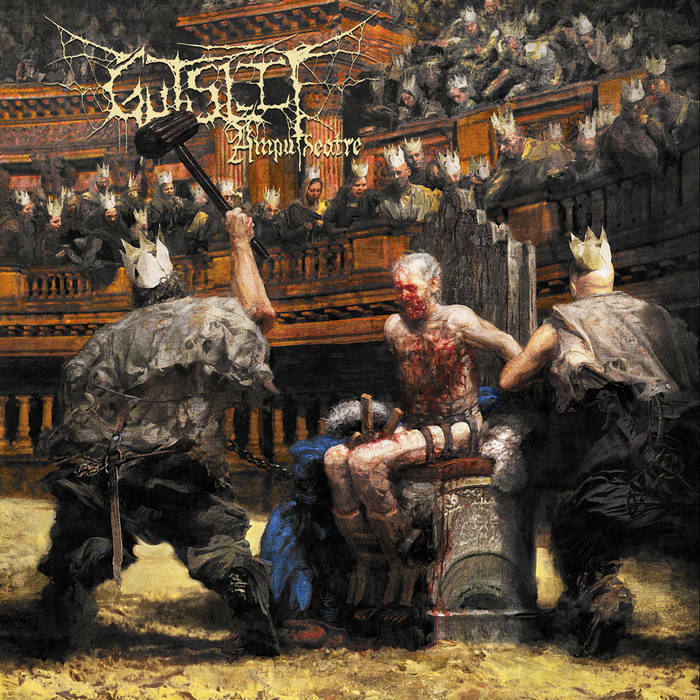 It also strikes me that Gutslit’s album art has taken a step up in the world, speaking of a more mature sense of gory carnage than that of their debut album, and once you start listening to the music it’s clear that a similar step up has happened in every other department of the band too. With Amputheatre Gutslit have ascended into the upper echelons of the death metal world. This is as professional and murderous a brutal death metal release as you could hope for. Taking the base of the style that they previously showcased on their debut album, Amputheatre develops this into streamlined, grind-infused brutality played with catchy carnage and memorable menace. The songs are well-written and miss no opportunity to crush the listener with barbarous riffs and pounding drums. The sense of playfulness that was on their debut album has largely been replaced with a more serious sense of lethality, and although I thought I might miss it I do not; the new Gutslit is a professional murder machine, full of serrated blades, blood-covered clubs, and monstrous presence. Not content with being a band that merely blasts their listeners into oblivion, Gutslit have a collective ear for a good riff and know how to bludgeon on many different levels. With good structuring and dynamics, this is death metal that kills with a variety of tools, from straightforward blasting, to crushing grooves, to punishing riffs, to grim atmospheres. This is not a one-dimensional slab of death metal at all, and Gutslit are to be commended for their songwriting, along with many other things actually. A faultless, pristine production rounds things off, and there’s no part of Amputheatre that has disappointed. This has been worth the wait. Well, as much as I enjoyed Skewered in the Sewer, Amputheatre wipes the floor with it, as it does with a surprisingly huge amount of their peers’ albums too. This is premier-league stuff, and if I was a high-profile label I’d be knocking on Gutslit’s gore-covered door loudly and firmly. Mixing elements of Dying Fetus, Aborted, Cattle Decapitation, and many others into its brutally effective and compelling embrace, this is an essential listen for any death metal fan. This entry was posted in Death Metal and tagged brutal death metal, Death Metal, Godless, Gorerotted, grind, Grindcore, Gutslit, Metal. Bookmark the permalink.